Thermeta Service BV has its own fully equipped development, production and electronic departments and an extended service organisation. The Thermeta service engineers take care of the commissioning of the burner equipment, maintenance and periodic inspections. 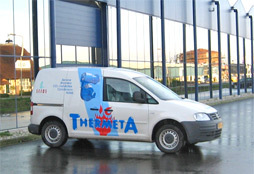 Besides, Thermeta offers a 24-hour emergency service that can be quickly at any location in the Netherlands. Thermeta has been certified for SCIOS 1) for carrying out the required maintenance, inspections and measurements. For further information please contact Thermeta Service BV. Of course, Thermeta Service BV has the most experience and expertise with respect to its own products, but we also professionally and effectively maintain a considerable number of burners of other brands. Stichting Certificatie Inspectie en Onderhoud Stookinstallaties [Foundation for Certification, Inspection and Maintenance of Combustion Plants] (SCIOS) manages a quality system in the specific area of professional combustion plants. For this the foundation has set up the SCIOS certification system. Owners of a SCIOS certificate carry out maintenance and inspection activities in compliance with the legally required quality concerning efficiency, safety and environmental impact. The SCIOS was founded on 27 May 1998 and is managed by a board in which the competent authority (the municipalities), those subject to Order in Council (the buyers) and executives are represented and with an independent chairman. SCIOS is supported by a Central Council of Experts that consists of representatives of AVAG, Gasunie, KW2, VIV/VLWK, FIGO, VNI, FME/CVM/VFK, observants on behalf of LMI/FHI and Visa committee, representatives of the associated certifying authorities.